McDonald’s Gospelfest has emerged as the nation’s preeminent Gospel celebration bringing joy, inspiration, encouragement and hope to the world. There’s no other gospel concert in the New York Metro area with so many Gospel greats set to perform on one stage, for one night only. Newark, NJ (THE WIRE PRESS) – Emmy Award winning, Executive Director and Producer, A. Curtis Farrow and his high energy team have been tapped to present the 33rd Annual McDonald’s Gospelfest for the 17th consecutive year. McDonald’s Gospelfest has emerged as the nation’s preeminent Gospel celebration, bringing joy, inspiration, encouragement and hope to the world. There’s no other gospel concert in the New York Metro area with so many Gospel greats set to perform on one stage, for one night. This year’s theme, “Honor Thy Mother” will be an unforgettable experience with a stellar lineup including Pastor Donnie McClurkin, Yolanda Adams, Tamela Mann, Bishop Hezekiah Walker & LFC, Tye Tribbett, Karen Clark Sheard, Shirley Caesar, Jennifer Holliday and more at Prudential Center on Saturday, May 7, 2016. The competition starts at 4:00 pm and the concert begin at 6:30 pm. 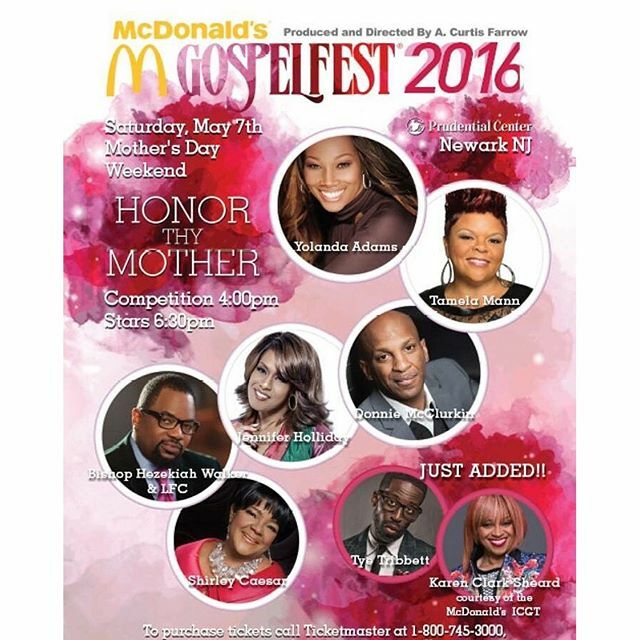 Many are calling this year’s McDonald’s Gospelfest “the best line up yet”. For tickets go to the Prudential Center Box Office, or call Ticketmaster at 800.745.3000 or go online to http://www.ticketmaster.com. McDonald’s Gospelfest will be an evening to remember. “Each year I get more excited about the show, but this year I’m so excited, and I just can’t hide it, I’m about to lose control and I think I like it. This year’s anointed line-up is definitely the best in the 33 year history of McDonald’s Gospelfest,” says the Emmy Award Winning Executive Producer and Director of McDonald’s Gospelfest, A. Curtis Farrow. The Grammy Award winning worshiper himself, Pastor Donnie McClurkin is guaranteed to lead the concert goers into a spirit-filled worship encounter that can empower and impact lives. It only gets better; Grammy Award winning Yolanda Adams, with her angelic sound, is ready to raise the roof and take everyone to the secret place of high praise and worship. Also, appearing for the first time in McDonald’s Gospelfest is the soulful powerhouse, Stellar Award winning and Grammy Nominated, Tamela Mann. The Godmother of gospel music herself, Grammy Award winning Pastor Shirley Caesar will tell the story of gospel through her timeless and anointed singing. McDonald’s Gospelfest’s very own, Grammy Award winning Bishop Hezekiah Walker and the high energy Love Fellowship Choir are ready to lift Him up through every praise. From the original Broadway cast of Dreamgirls, Tony Award winning artist Jennifer Holliday will also take the stage, backed by a 200-voice choir, performing her Broadway smash hit “And I’m Telling You.” McDonald’s Gospeflest continues to get bigger and just added Grammy Award winning Tye Tribbett, who will light up the stage with his electrifying performance. Also, the Gospel Legend and Grammy Award winning, Karen Clark Sheard is going to sing unto the Lord a new song. Irving Street Rep is a high energy marketing, public relations, theater and event planning agency headquartered in Newark, NJ. Under the leadership of CEO A. Curtis Farrow, Irving Street Rep has provided services for clients such as McDonald’s, DuPont, Citibank, Entenmanns, Bloomindales, The Museum of Natural History, and City Meals on Wheels. For more information please visit http://www.irvingstreetrep.com.